No electricity and "forest shower"
A secluded forest location, no electricity, cooking over open fire, bathing in cool clear lakes and drinking ice-cold water from the well - Back to Basics in Cosy Cabins epitomises the simplicity, beauty and purity of a traditional Swedish summer holiday. With a choice of accommodation, this experience is ideal for families looking to spend quality time together in a beautiful natural environment as well as couples or friends looking to really "get away from it all" and leave the trappings and bustle of modern civilisation behind for a while. Cooking over open fire is a wonderful learning experience for all ages. Photo: NB. "Cuckoo's Nest" Tree House: As the name suggests, a cabin in the trees! Ideal for couples. "Lake View" Tree House: A newly-built cabin also in the trees! Ideal for couples. Floating Cabin: Beautifully situated out on the lake (a canoe is provided for reaching land). Ideal for couples or a family of 4 (not suitable for 4 adults). But "basic" does not mean "uncomfortable"! The Forest Cabins, Lake View Tree House and Floating Cabin are heated by wood-burning stove and lit by paraffin lamps (Cuckoo's Nest Tree House is unheated and most suitable for stays spring-early autumn). In the evenings, relax in a wood-fired sauna right by the water's edge before jumping into the lake to cool off. For those who would prefer a shower to a refreshing morning dip, there is a "jungle shower" using water heated in a pot over open fire. Cooking is also done over open fire and the "longhouse" provides a cooking and eating area or simply a place to relax and reflect on the day's adventures. Use of canoe is also included for your stay, giving you a chance to explore the area by paddle power. The surrounding forests are rich in wildlife including elk and beavers. Back to Basics in Cosy Cabins gives you the opportunity to appreciate the simpler (and many would say the most important) things in life - clear air, cool water, a roaring fire, a swim beneath the stars and the company of friends. Families will appreciate the endless playground nature provides for children, while couples can unwind in a tranquil and nourishing atmosphere and find the time to reconnect. Choose to enjoy the atmosphere of the cabins and surrounding area or, if you have a car, it is just 20km to Glaskogen Nature Reserve, which offers extensive areas of wilderness and a stunning network of lakes and is a wonderful area for hiking. Please let us know your arrival time. You will normally have access to your cabin from 15.00, but if you arrive earlier and your cabin is not yet available you are welcome to make use of the camp facilities. Dates by arrangement between 1st May and 30th September 2019, minimum stay 2 nights. The Forest Cabins, Lake View Tree House and Floating Cabin are suitable for stays throughout this period. For the Cuckoo's Nest Tree House, mid-May to late September is the most suitable period, as this cabin is unheated. Hot tub session: See image below. A wood-fired hot tub can be booked in advance, capacity 8-10 persons. NB: These cabins are in a fairly remote location. The experience is accessible by public transport (see "Optional extras" below) and it is not essential to have a car, but you will require a car if you would like to explore the local area. The two tree houses are approx 50m or so apart and both feel quite private. The Floating Cabin can be seen out on the lake but is at least 300m away. From the Floating Cabin, it is difficult to see the tree houses. 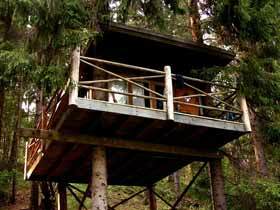 Forest Cabins: Sleep 1-4 persons in bunk beds. 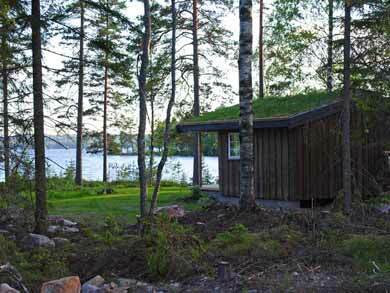 Cabins have grass roof and are heated with wood-burning stove. If you are a family of 5 with younger children, an additional mattress on the floor can be added (free of charge) to the cabins, though note that this will of course reduce available space. "Cuckoo's Nest" Tree House: Sleeps 1-2 persons in double bed. Located approx. 50m from the water and approx. 200m from the swimming/sauna area. "Lake View" Tree House: Sleeps 1-2 persons in double bed. Located approx. 70m from the water and approx. 200m from the swimming/sauna area. Heated by wood-burning stove. Floating Cabin: Sleeps 1-4 persons (max. 2 adults + 2 children) in double bed + 2 x bunk beds. Bunk beds (180cm x 70cm) are suitable for children and are combined couch and bed - the backrest lifts up to form upper bunk. Heated by wood-burning stove. Dry toilet and cooking facilities. NB: For families, please note that the cabin veranda has no barrier. Children should be able to swim. Meals are self-catering. The nearest shop for food is approx. 2km from the camp. There are several fireplaces around the camp for making food over open fire, as well as in the "longhouse" which provides cooking and eating area. Wood is available for guests to chop themselves for fires. Pots, pans and simple utensils are provided for making food as well as cutlery, plates, etc. Use of wood-heated sauna (capacity 8-10 persons) is included during your stay. Wood is available for you to heat the sauna yourself. There is no electricity in or around the cabins. Lighting is by oil lamps. There is no running water. Drinking water is taken from the well. Toilet facilities are dry outside wilderness toilet. A "jungle shower" using water self-heated over open fire in a large pot is available. 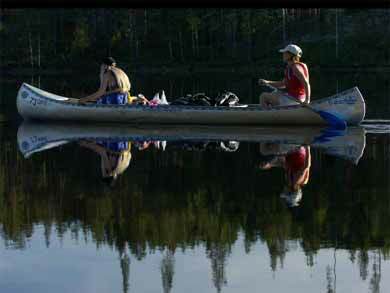 Canoe: there are nine Canadian canoes (Trapper 525) at the camp which guests are welcome to use during their stay. Paddles and buoyancy aids are provided. You should have general good health. This experience is ideal for both adults and families. In early/late season (May to mid-June, September and October) you should be prepared for cooler conditions. For families staying in the Floating Cabin, children must be able to swim. Please note that the veranda around the cabin has no barrier. There is great flexibility to make your stay as relaxing or active as you wish. The simple "bushcraft-style" nature of the accommodation and facilities gives a higher level of challenge compared to a fully-featured cabin experience. Activities you choose to do during your stay will of course also affect the level of challenge. This experience is ideal for small groups of friends or families travelling together. The three Forest Cabins sleep 4 persons per cabin, total 12 persons. The Cuckoo's Nest and Lake View tree houses accommodate 2 persons per cabin, while the Floating Cabin accommodates max. 4 persons (2 adults + 2 children). 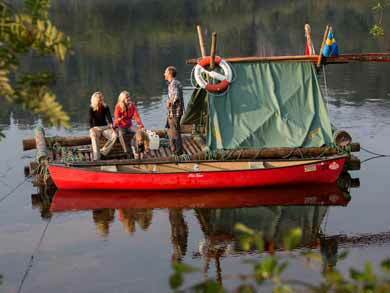 This host has a written environmental policy and is a member of the Swedish Ecotourism Society. You can choose to fly to Stockholm, Gothenburg or Oslo airports. From Oslo or Stockholm, you travel by public transport to Karlstad (around 2.5-5.5 hours depending on options chosen) or from Gothenburg you travel to Säffle (approx. 2 hours). From Karlstad or Säffle, you travel by local bus (approx 1 hour) to the cabins. You can also choose to travel by hire car. Ferry Dover-Dunkirk or Newcastle-Amsterdam for onward train connections to Karlstad. Recommended by Penny Bunting in Green Adventures Travel. Read about Niki and Jayne's visit and Sofia's visit (sleeping in the Floating Cabin) to the Back to Basics cabins on the Nature Travels blog.